Sanders Gaining On Clinton. 2008 All Over Again? : It's All Politics Vermont Sen. Bernie Sanders has the energy, the enthusiasm and now showing strength in the poll numbers as the Democratic nomination contest looks more and more like a race every day. 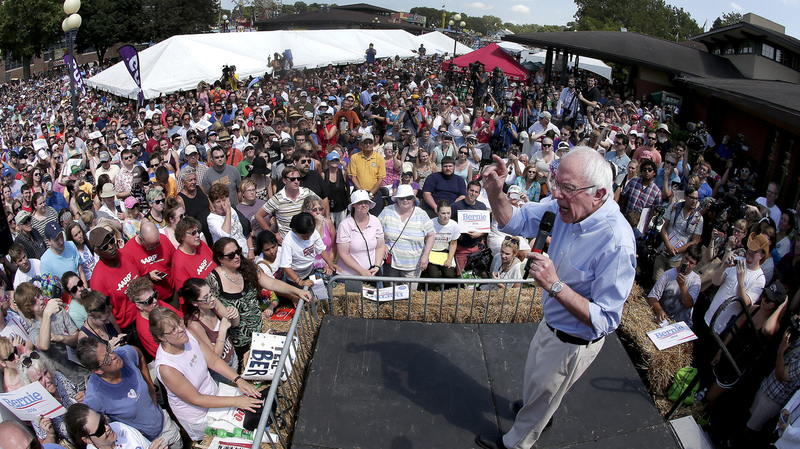 Vermont Sen. Bernie Sanders speaks at the Iowa State Fair. A new poll out Saturday shows Sanders gaining on front-runner, Hillary Clinton. When a wispy-haired, septuagenarian senator from Vermont with a Larry David-style and a life-long passion for talking about income inequality decided to run for president, not many took him seriously. That's especially true, considering that senator, Bernie Sanders, was going up against the New York Yankees of Democratic politics — the Clintons. But now Sanders is gaining in the polls, including in the gold-standard poll in Iowa — out Saturday night. The Iowa Poll, paid for by Des Moines Register and conducted by the reputable J. Ann Selzer, showed Sanders just 7 points behind Hillary Clinton, who leads 37 to 30 percent among likely Democratic caucus-goers. "This feels like 2008 all over again," Selzer told the Register. Wow. 2008 all over again? That's when a heavily favored Clinton stumbled and lost to Barack Obama, then a young senator whose middle name, Hussein, was the same as a dictator the U.S. had just overthrown and whose last name rhymed with America's Public Enemy No. 1. Oh, and he was black, trying to win — not only a primary in a lily-white state — but to become president — of the United States. 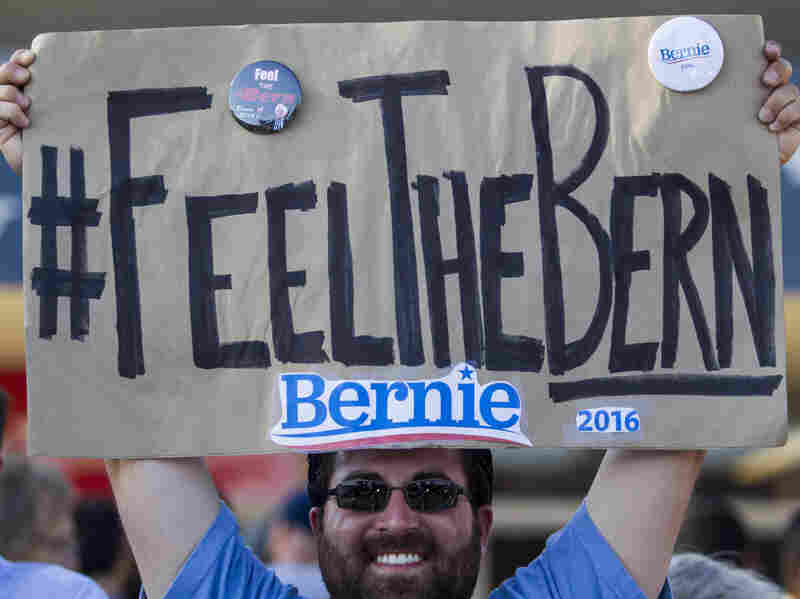 Frank Rothstein holds a "Feel the Bern" sign before a rally Bernie Sanders in Los Angeles that drew tens of thousands. The phrase has become an anti-establishment rallying cry for Sanders fans. Selzer's parallels? Sanders, like Obama, is winning people who say they are going to caucus for the first time and young voters. Plus, his support appears to be strong — his backers say they actually like him; they're not motivated by an anti-Clinton vote. It's a result that would have been considered unfathomable seven months ago. Back in January, Clinton led Sanders in the Iowa Poll — get this — 56 to 5 percent. The poll also shows Vice President Joe Biden's support jumping from 8 to 14 percent, as buzz surrounding whether he will get in has grown. Clinton, who has struggled over the last several months to combat the controversy surrounding her use of a private email server as secretary of state, had (and still has) many of the structural advantages needed to win a presidential nomination — money, staff, endorsements. But Sanders has grassroots energy, and that's key in a caucus state like Iowa. What's more, Sanders is also gaining in his neighboring state of New Hampshire (where some recent polls have shown him in the lead). That's especially troubling for Clinton because New Hampshire has always been something of a home base for the Clintons. It's where Bill was dubbed the "Comeback Kid." It's where Hillary turned the 2008 nominating contest into a long-term slug fest with Obama after she pulled off the upset when all the polls showed her doomed on the eve of the primary. Sanders is no Obama. He doesn't have the kind of field operation, for example, at this point needed to go the distance. But he's done enough to make the Clintons sweat, and that's not something anyone expected.